Stan and Jennie, a couple from Calgary, were looking to build a unique home in the foothills of the Canadian Rockies. 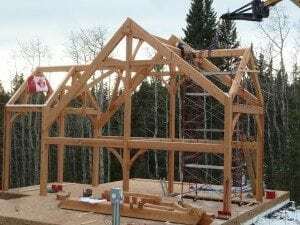 Wanting to leave the bustling city life behind without being completely disconnected, the Rockies provided the perfect haven for them to build their dream timber frame home. Impressed by their services, integrated building system and design options, the couple decided Riverbend was the perfect company to create their home. The couple browsed through several Riverbend floor plan concepts, including the Brookville which was their initial inspiration. They had already begun the design process with this plan when they discovered the Cattail Lodge design. With an abundance of outdoor living space and an open floor plan, the couple decided that the Cattail Lodge would be the perfect starting point for their unique needs, location and budget. Riverbend experienced professionals began their timber frame installation in early November of 2011. With the winter freeze setting in across Alberta, the crew faced early challenges during the installation. At times the project location was almost inaccessible due to the steep hill grades and ice that coated the roads. But cold weather would not deter the experienced crew and the frame went up beautifully. Stan and Jennie were on hand and very excited to see their future home rise before their eyes. 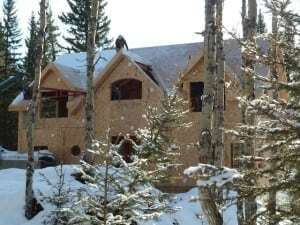 More recently, construction of their timber home continues and the drying-in stage is almost complete, leaving them just enough time to move in as Alberta shakes off the cold of winter and springs into a new season. Stay tuned for final stage photos of Stan and Jennie’s timber frame home, coming later this spring.